A very rare working in terms of multiple units took place on 25 January 2017 when Reading-based Class 150/0 No. 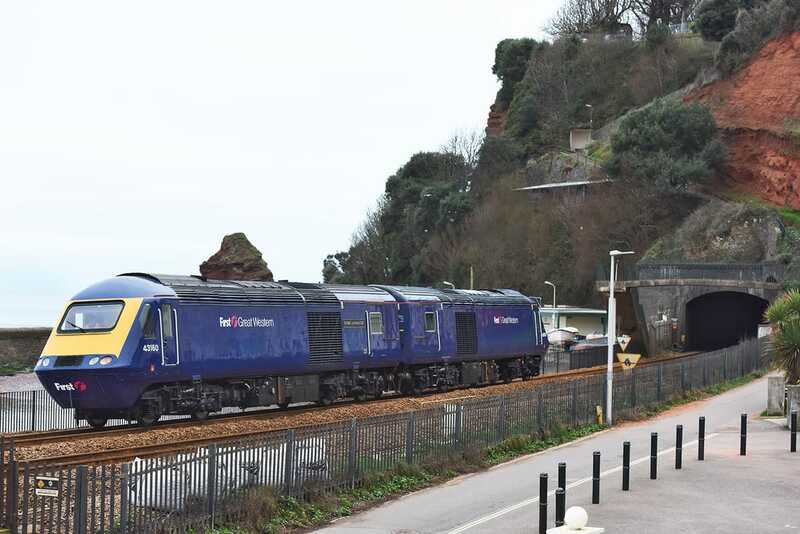 150002 which has been in the Bristol area for a few days, was used to form 2C67, the 07.59 Cardiff to Paignton in place of the usual Class 150+153 formation. 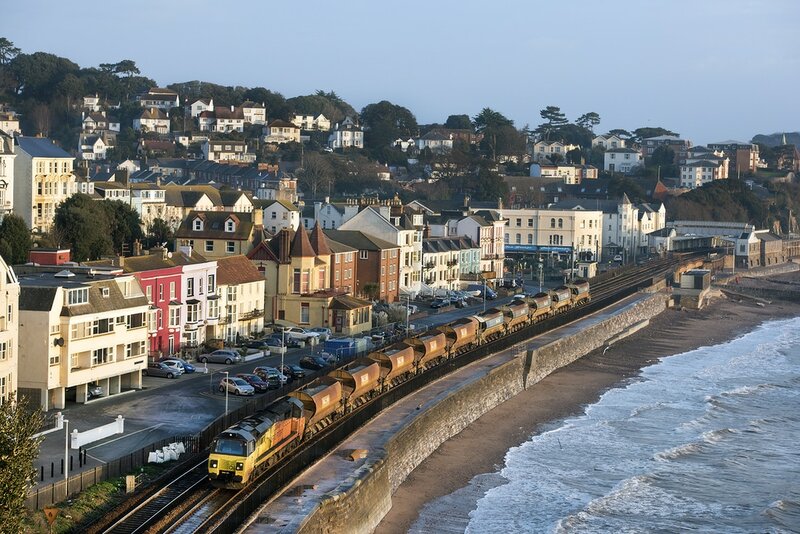 The train is seen departing from Dawlish heading for Kennaway Tunnel. 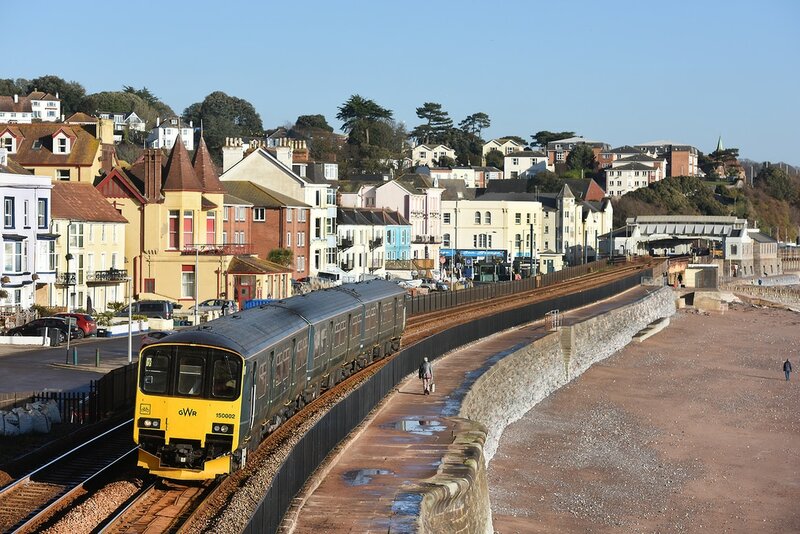 We have seen the three-car Class 150/0s down on the wall before on days such as Dawlish Air Show, but this is the first time down for a set in green livery. 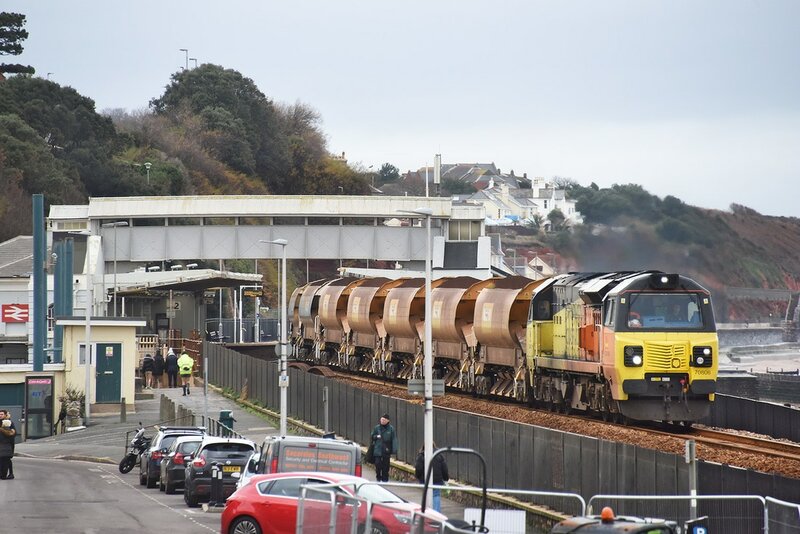 On a mist 23 January 2017 morning, those nice chaps from Colas Rail Freight managed to provide a little colour for the sea wall in the form of 6C22, the 16.00 (22/1) St Erth to Westbury via an overnight sleep in Penzance. The train, powered by Class 70 No. 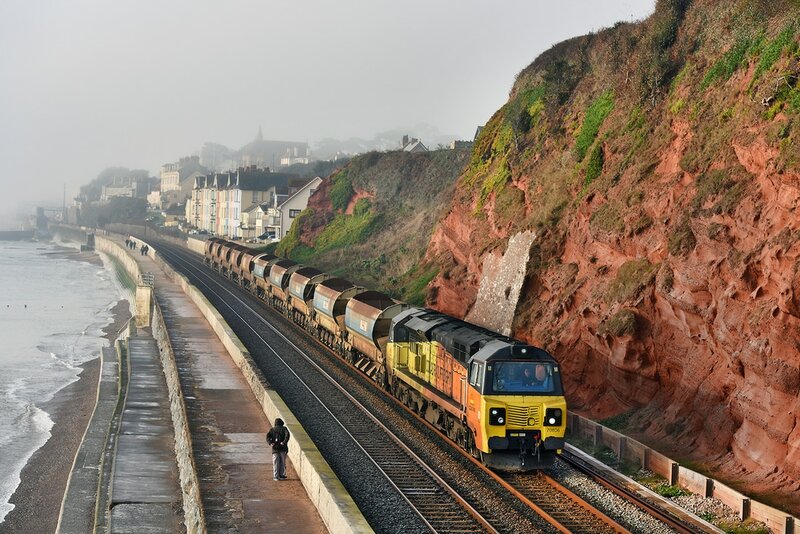 70806 approaches Black Bridge on the Dawlish Sea Wall. 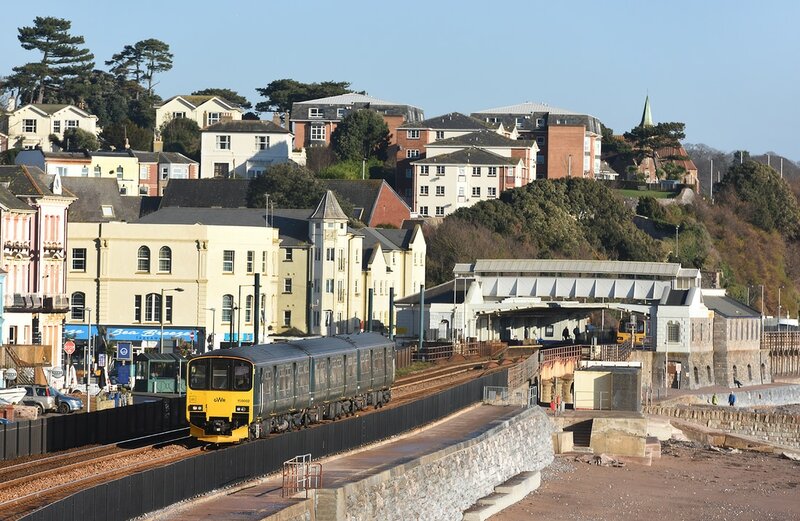 Nice lighting in Dawlish this morning (22 January 2017) for the 6C22 the 09.06 Exeter Riverside to Truro loaded ballast. Powered by Colas Rail Freight Class 70 No. 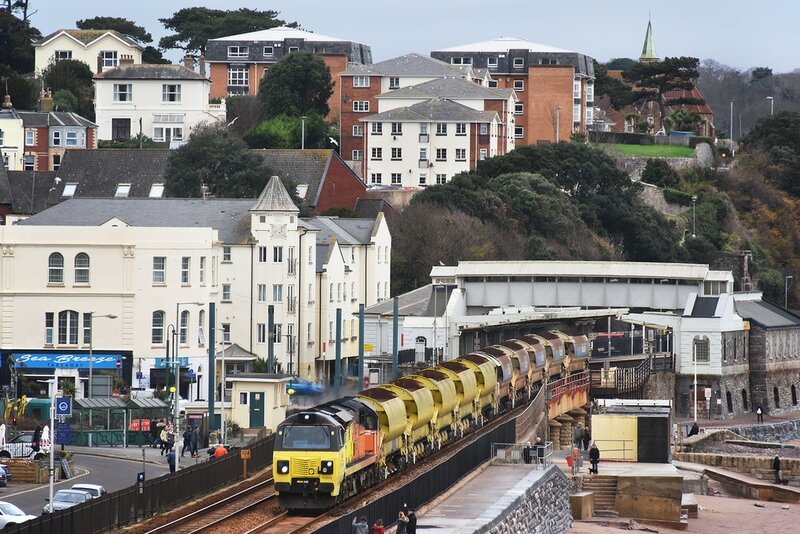 70806 the train skirts King's Walk, Dawlish. 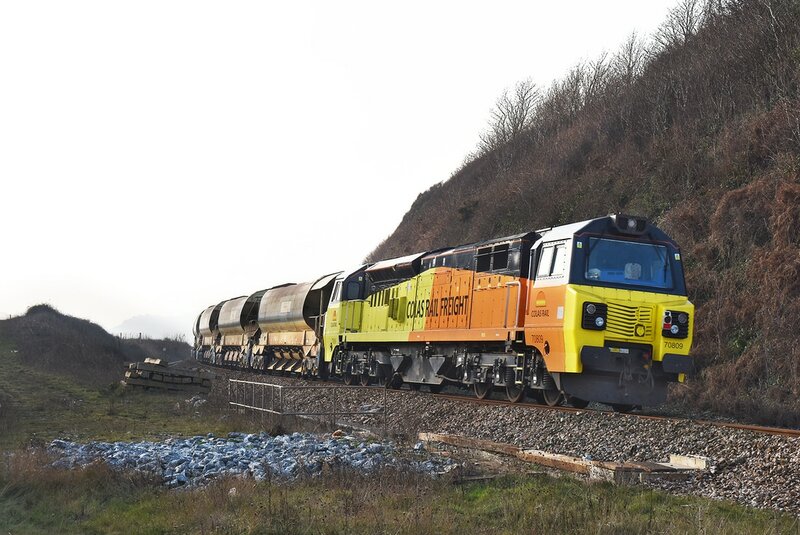 In conjunction with the track relaying west of Truro; on 22 January 2017, a Colas Rail Freight auto-ballasted set operated as train 6C23, the 09.51 Westbury to Penwithers Junction (Truro), 'top and tailed' by Class 70s Nos. 70805 and 70809. 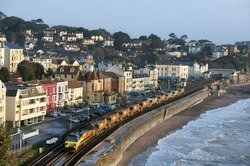 The train is seen rounding the curve at Dawlish Warren running some 30mins ahead of schedule. 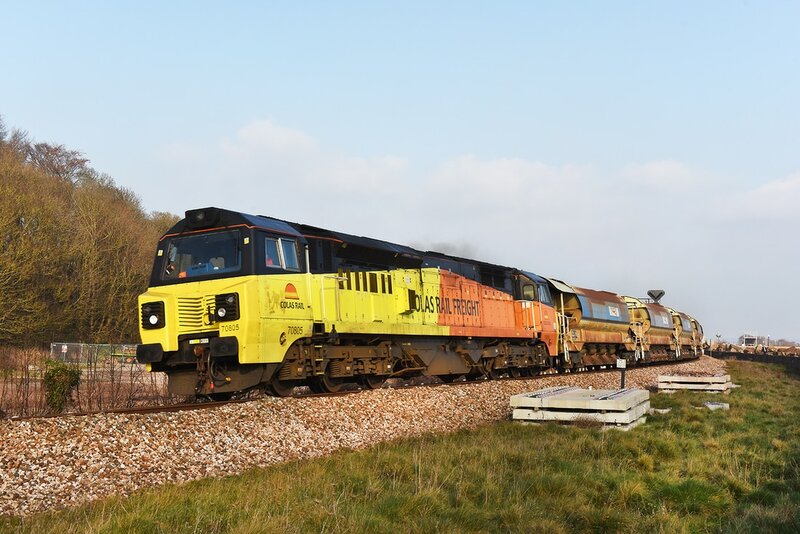 The Sunday Colas take over on the Sea Wall continues on 15 January 2017 with 6C20, the 12.00 Truro to Westbury formed of the removed rail sections. Running rather a few hours late, its powered by No. 70804 and is seen emerging from Kennaway Tunnel. 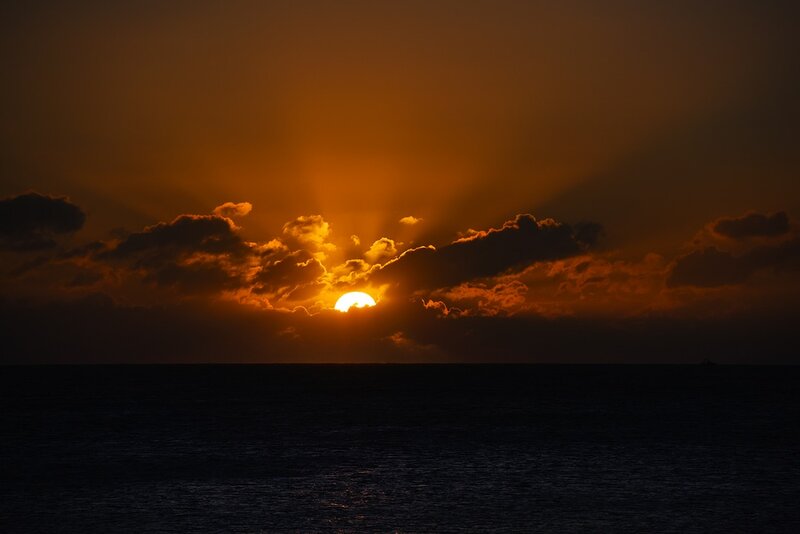 Glad he evenings are drawing out. Running some 152min late due to problems at Westbury, 6C23 the 08.43 Westbury to Truro headed by Colas Rail Freight Class 70 No. 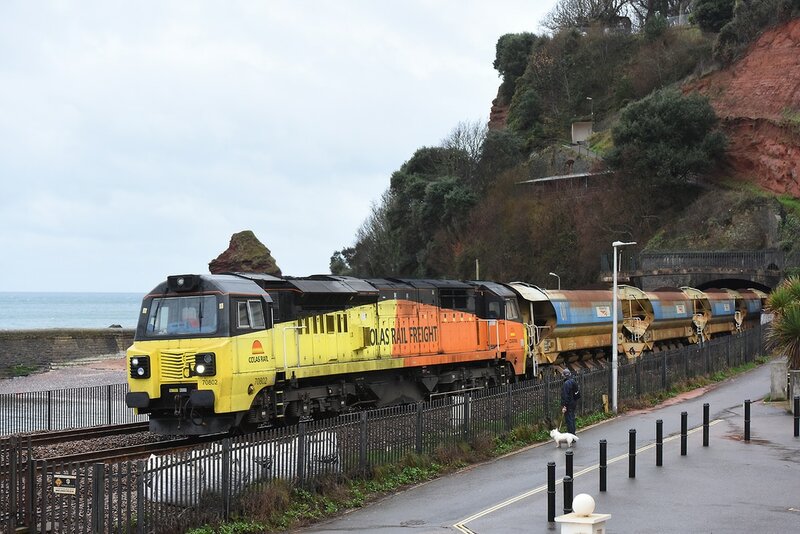 70806 with loaded ballast pulls through Dawlish on 15 January 2017. On the rear was Class 66 No. 66846. Again, pity the light was not a bit better. Not in the best of light, but non-the-less an interesting Sunday working is Colas Rail Freight Class 70 No. 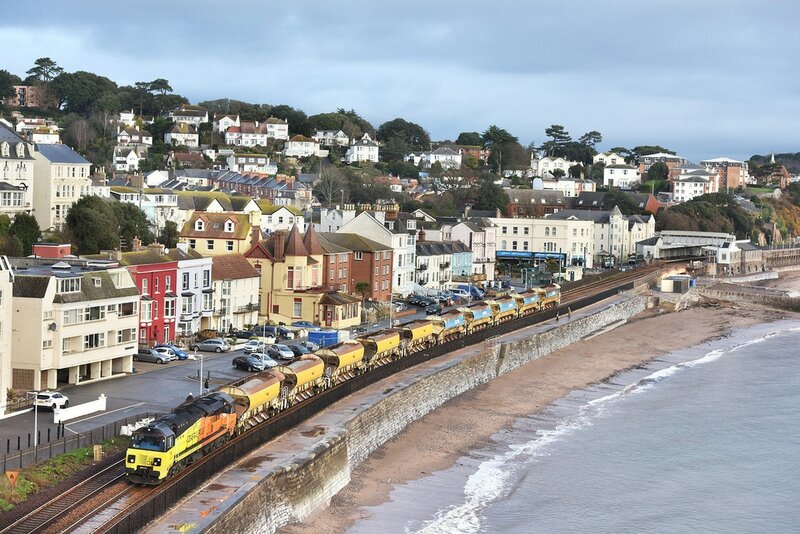 70805 storming through Dawlish station on 15 January 2017, heading west with a very late running 6C22, the 09.06 Exeter Riverside to Truro, formed of 10 loaded 'Autoballaster' wagons, including five 'Metronet' vehicles. 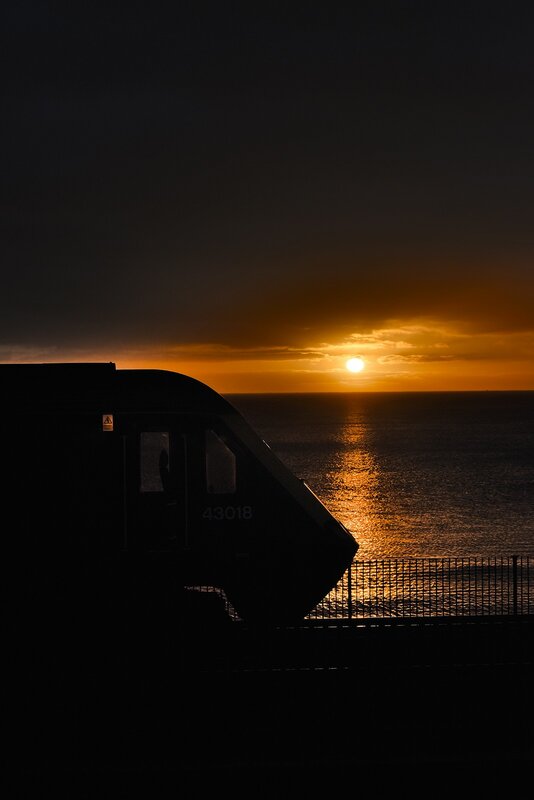 Sun rise over Dawlish - 11 January 2017. 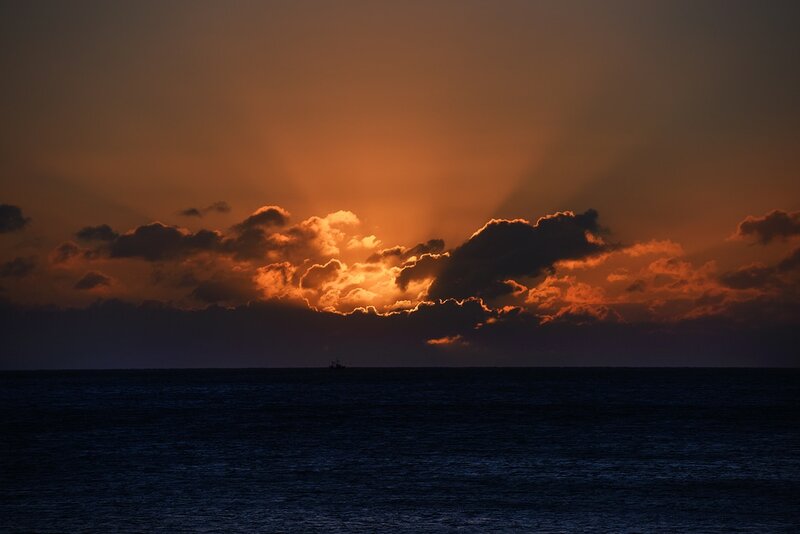 Sunrise over Dawlish, 13 January 2017. The paint brush has been out on 43185 'Great Western'. The front end has been repainted, now with small numbers, and it looks as if the grey on the nose end has been reapplied while the bodyside grey remains the same. Very neat job. Released from Laira today 13 January 2017. 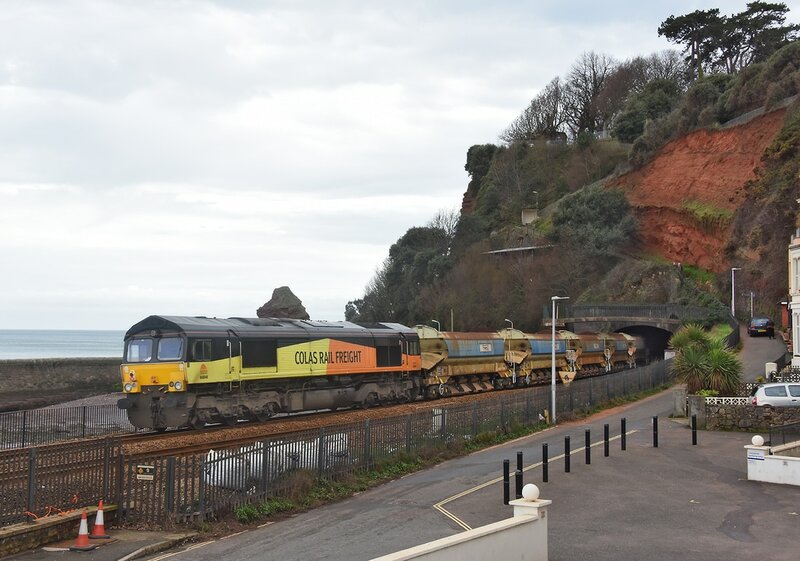 Running as 0Z70 15.00 Laira to Old Oak Common, seen emerging from Kennaway Tunnel, Dawlish in company with No. 43091. I was hopeful for a nice bright and sunny morning, but no, total dull. Colas Rail Freight Class 70 No. 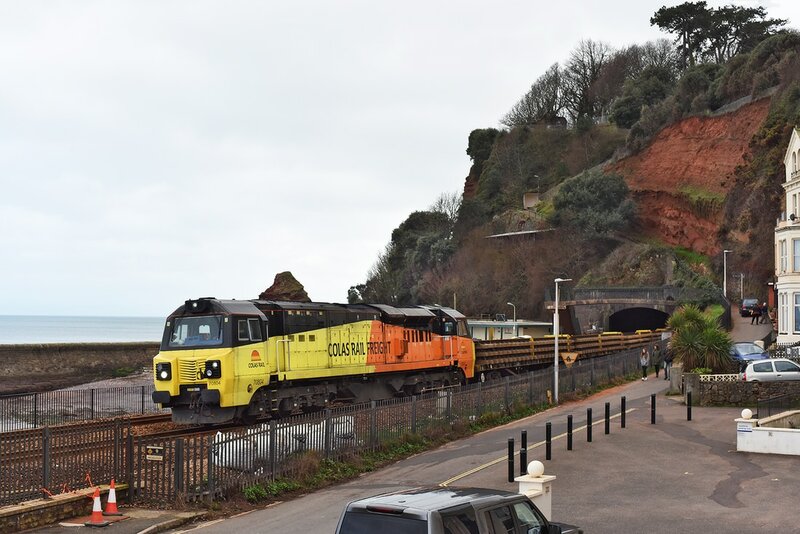 70802 emerges from Kennaway Tunnel, Dawlish on 9 January 2017 powering train 6C24, the 16.00 St Erth (of 8/1/17) to Westbury via Penzance. Thankfully the livery brightens up the pic! 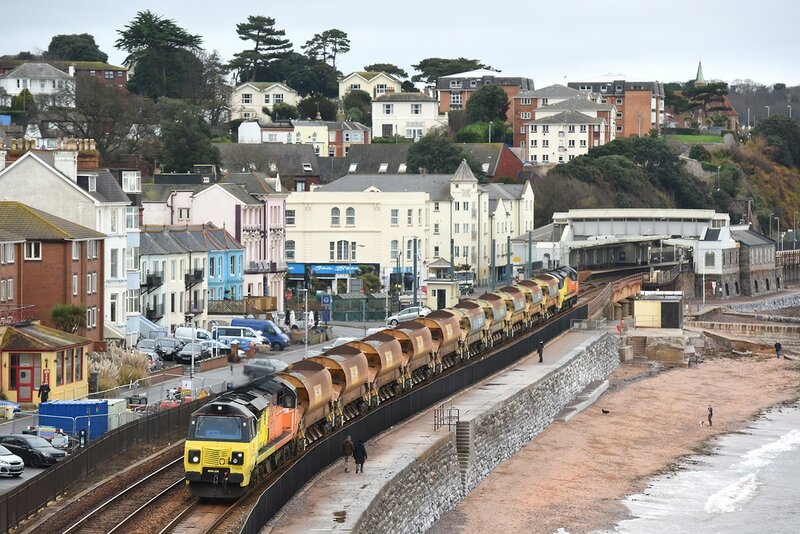 Colas Rail Freight's 6C25, the 09.00 Westbury to Truro 'top and tailed' by Class 70s Nos.70805 and 70807 skirts King's Walk, Dawlish and heads for Kennaway Tunnel on 8 January 2017. A nice bright Sunday morning in Dawlish and the 'yellow' parade continues into 2017. On the morning of 8 January 2017, Colas Rail Freight Class 70 No. 70802 heads towards Kennaway Tunnel with train 6C24, the 09.06 Exeter Riverside to Truro formed of 10 loaded NR ballast hoppers. Following its involvement in a serious collision at Plymouth station on 3 April 2016, when an HST was 'rear-ended' by a Class 150, power car No. 43160 has been under repair at Laira depot, where a new cab end has been installed. On 4 January 2017, the power car in company with No. 43016 operated a light engine test, 0Z77, 11.00 Laira to Laira via Exeter St Davids. 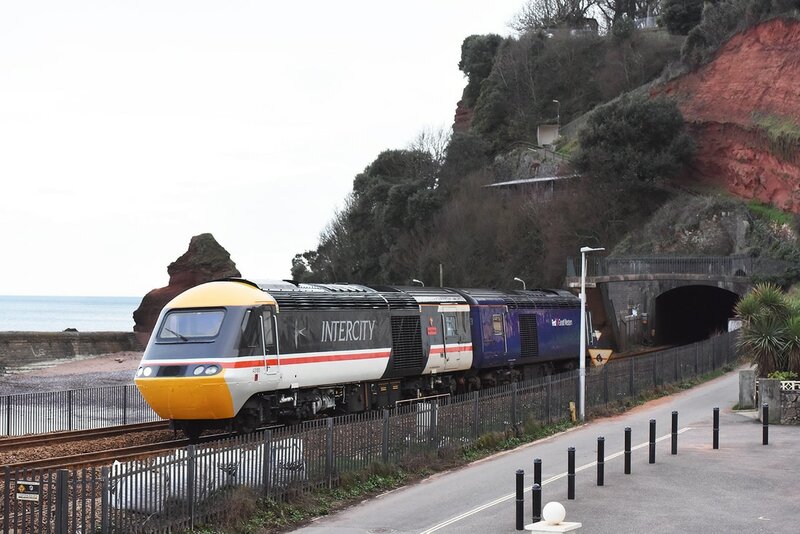 The return run is seen about to enter Kennaway Tunnel, Dawlish.